The Rolls-Royce engine is set up here in free-jet mode inside the AEDC C-2 test cell at Arnold Air Force Base. Transonic speeds with large volumetric flow rates were recently achieved during free-jet testing of this high-bypass engine, setting a record for free-jet mode engine testing. 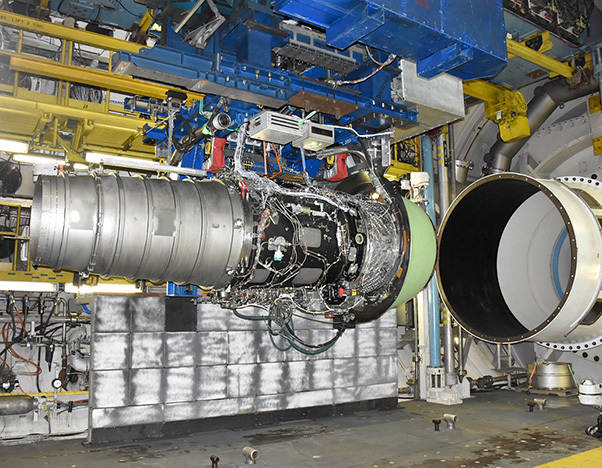 Transonic speeds with large volumetric flow rates were recently achieved during free-jet testing of a high-bypass engine in the AEDC C-2 test cell at Arnold Air Force Base, Tenn., setting a record for free-jet mode engine testing at Arnold. According to Doug Hodges, test engineer with the Propulsion Combined Test Force, free jet testing at C-2 is typically conducted at lower air speeds. In direct-connect mode, the engine inlet is directly connected to the plenum receiving all the air that is being delivered to the test cell by the plant machinery. Since all the air has to go through the motor, direct connect mode can reach higher Mach numbers more easily than free-jet testing. Free-jet testing takes place when an engine is not directly connected to the plenum inside the test cell. Instead, an open nozzle is blowing air into and around the engine inlet cowling. In free-jet mode, only 25 percent or less of the air delivered by the facility is ingested by the engine, the remaining air flows around the engine and through the cell. Due to this setup, a massive amount of air from plant machinery is required to set higher Mach conditions in the cell. Will Perkins, Plant Operations engineer, indicated it is more challenging to run in free-jet mode because more plant machinery is required to operate for the higher air flows. “This condition used all of our air supply machinery and most of the exhaust capability,” Perkins said. For this test, the C-2 test cell received more than 3 million cubic-feet of air a minute. “That’s equivalent to pulling out all the air filling up a warehouse that is 150-feet long, wide and tall every minute, which is significantly more than our average engine test,” said Adam Moon, AEDC test analyst. Moon explained that the free-jet testing of large bypass turbofans in the engine test cells at Arnold has been limited to icing testing. AEDC test teams were conducting engine testing of a Rolls-Royce engine when the record-breaking achievement occurred. Rolls-Royce has tested several of its engines at Arnold AFB, such as the Rolls-Royce Trent 800 used to power the Boeing 777, the Trent 900 to power the Airbus A380 and the Trent 1000 for the Boeing 787. Mike Magistro, Test Operations engineer at Arnold AFB, mentioned the dedication of the team attributing to the success of the test.